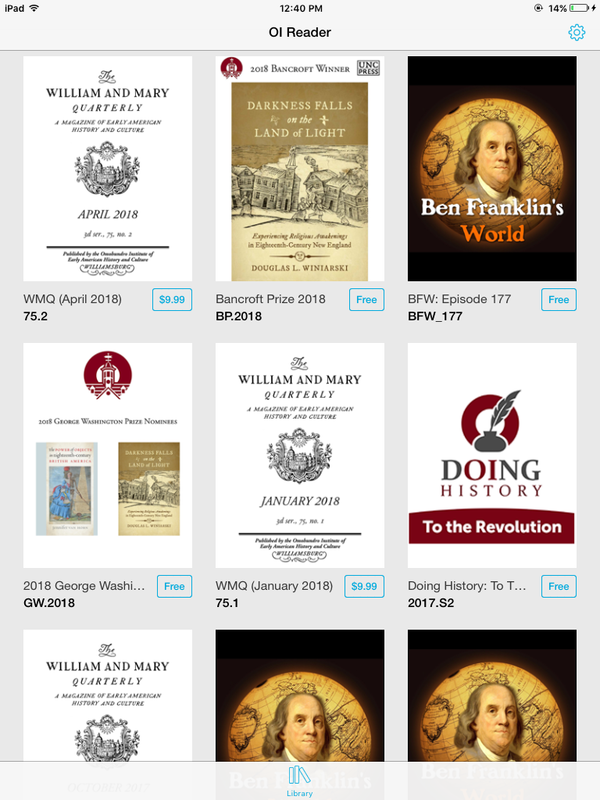 When opened, the OI Reader shows icons for several different chapters, podcasts, books, and William & Mary Quarterly articles. Scrolling further down the page on your phone or tablet displays more options. Please note that all materials featured on the OI Reader are free except for current William & Mary Quarterly issues. These issues feature a free 2-3 page preview, but can also be purchased in their entirety for full access. The price-per-issue is listed below the WMQ icon within the app and is outlined in light blue. See the above image for examples. The OI Reader and its content can be broken down into several navigational features. Please click on any of the buttons below for a guide to these main features and their functions. For the following tutorials, we will use Simon Newman’s digital William & Mary Quarterly article, entitled “Hidden in Plain Sight: Escaped Slaves in Late Eighteenth- and Early Nineteenth-Century Jamaica.” This exclusive digital-only article is free to download on the OI Reader.